Sa Caleta is a cute little bay between the airport and Cala Jondal. 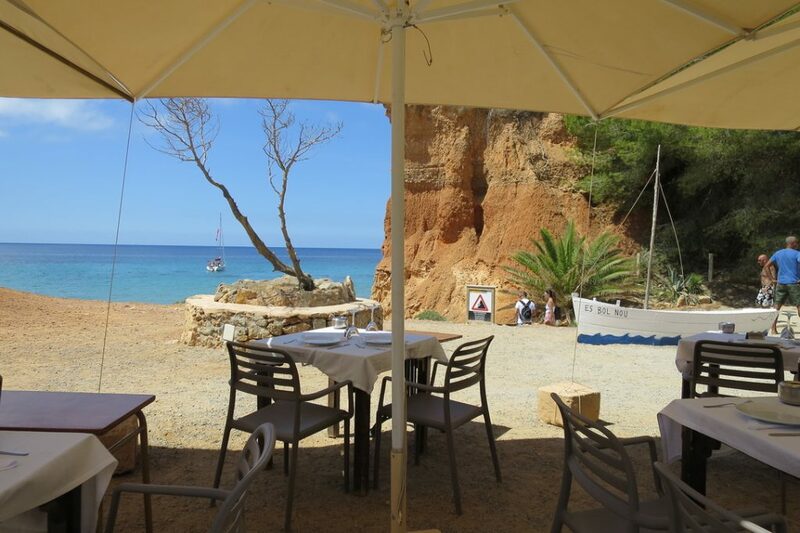 This small beach is surrounded by terracotta colored cliffs and there’s a nice restaurant. The restaurant has a nice garden where you can relax in the shade, and in front of the restaurant you have a beautiful view between the cliffs at the sea. A very nice spot to have dinner. We didn’t do that because we were here in the morning to start our island tour for that day. We have been before at this beach, where you can find a lovely little shop as well with nice bohemian style of fashion, but this highlight hotspot is not about fashion. Right after the restaurant there’s a little road up to the mountain, I understood that we had to take that road. 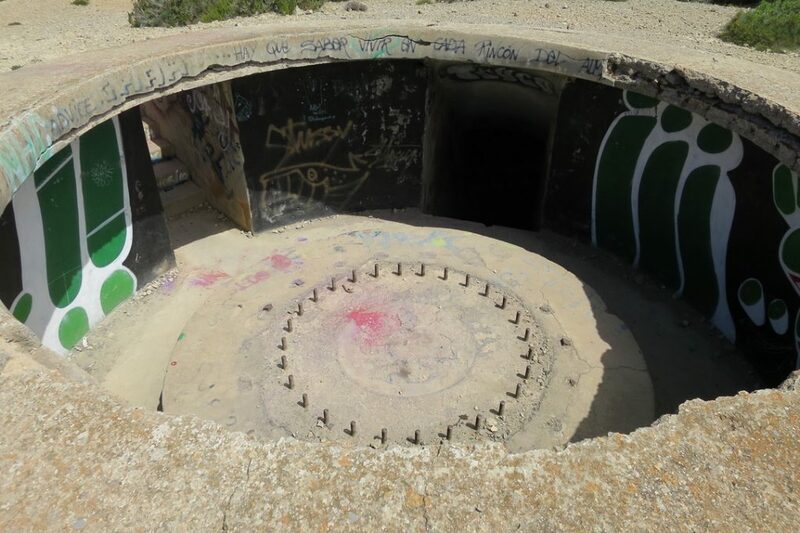 If you walk to the end, you will come to a big open field at the mountain, and right in front of you appears a military bunker from world war II. It was designed in 1940 for the protection of the coasts from Ibiza. You are able to enter the bunker, because the underground corridors are still unimpaired. Nice and very interesting to see! After we visited the bunker we continued our search at the secret tunnel with the beautiful view. 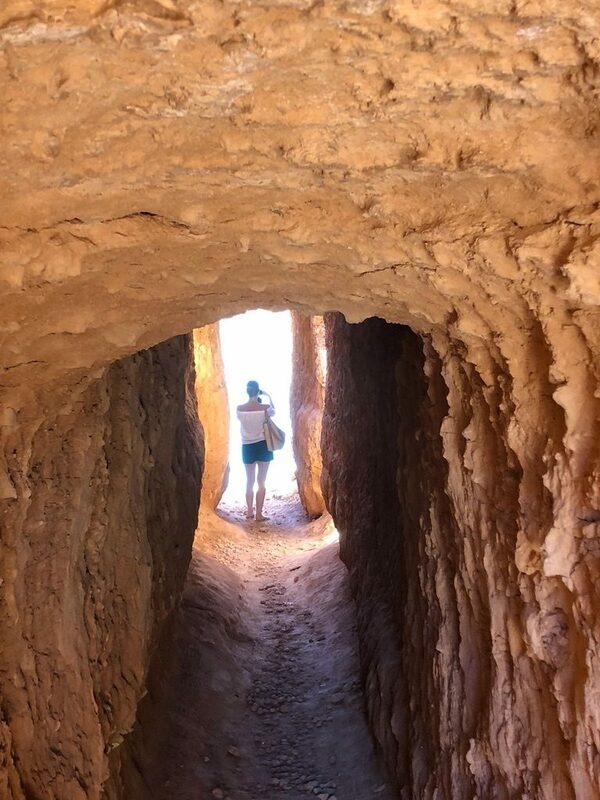 We went to the back of the bunker and there we found a fenced off area with the remains of simple stone buildings of the Phoenician settlement. The site has been designated a World Heritage Site. So some sort of bonus secret we’ve found because I didn’t know that. But still we didn’t found the tunnel I wanted to see. In the meantime the temperature went up, so we decided to go back to the restaurant to have a drink in their nice garden. And we’ve asked the staff where to find that tunnel. On our way back to the restaurant we took the road on the other side of the mountain, where you can find all kind of small fisherman’s sheds ( very nice to take some pictures ) and also on that side we didn’t find the tunnel. It was hidden very well. After our drink we continued our search. The friendly staff of Restaurant Sa Caleta explained us more or less how to find the tunnel. Somewhere before the building that we were crossing on our right hand-side right in the beginning of the road up the mountain we had to turn right. So that’s what we did. ( although we had the feeling it really could not be there ) But yes on our right side appeared a small hole with some sort of chink between the cliffs. 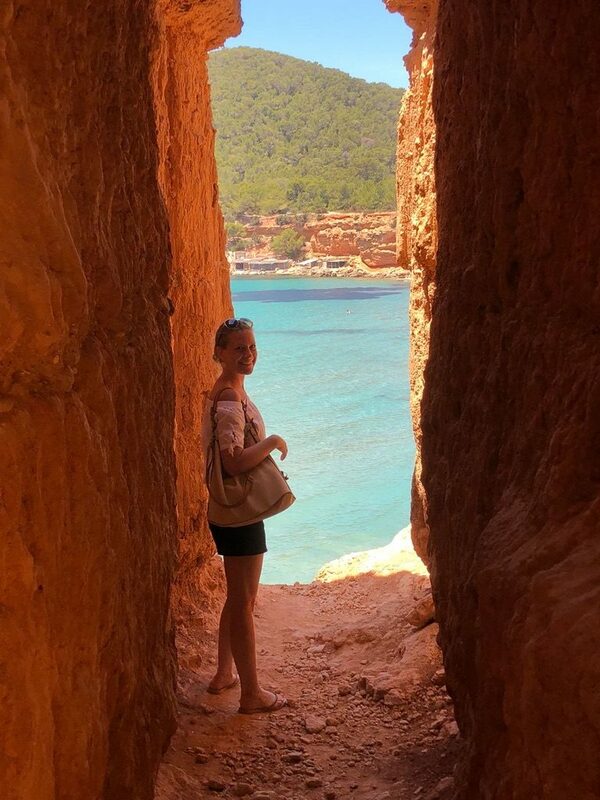 When you come closer you’ll see it’s a bigger hole with a tunnel and a breathtaking view at the sea. It was beautiful to see that terra colored cliffs in the front with that blue sea at the background! I loved to see it and enjoyed it, and was I happy we found it.